She Said YES! 6 ADORABLE Celeb Proposals That Had Us Go Aww! We love celebrities, but we love their love stories even more! It’s so amazing to hear about our favourite reel stars and their real love sagas. Some of them even had the perfect proposals planned. Leave everything you’re doing and be prepared to sigh and let out a big, fat “Awwwww!” Goals, amirite? Image: Kunal Kemmu on Instagram (here) The beautiful princess got the fairytale proposal she totally deserved! 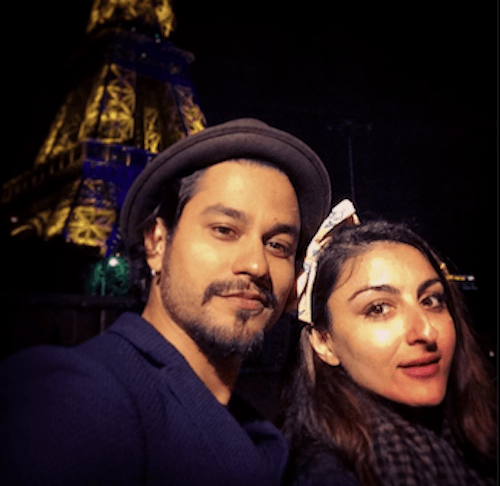 On a trip to Paris (most romantic city, of course), Kunal proposed under the Eiffel Tower with a stunner of a diamond ring (Soha described it as the most perfect ring in the world). We are proud of you, Kunal, for getting all the details right – your romance game is certainly on point! Image: Shutterstock Brad and Angelina have been giving us relationship goals since long, long before they officially tied the knot! Given how superbly unconventional they are, we are not the least bit surprised that the proposal was too! What really warms the heart, though, is that even after six kids together Angelina was still moved to tears when Brad Pitt finally proposed! Apparently Brad rounded up all of the Jolie-Pitt brood so they could be present as he surprised their mom with a 16-carat diamond engagement ring. She cried and smiled, and they all had a warm family moment. Now if that isn’t the sweetest thing you ever heard, we don’t know what is! Source: Ek Main Aur Ekk Tu These two childhood sweethearts (guys, when you meet at 19 – it’s considered childhood) had been dating for a long time before the actor decided to propose to his ladylove. He supposedly snuck into her house (brownie points right there), decorated her entire room with candles (sigh!) and went down on one knee to proclaim his love for her. WHO CAN SAY NO TO THAT?! Image: Lady Gaga on Instagram (here) She is anything but conventional, but even Lady Gaga had to give up her poker face for love! (Just look at the ring and equally cheesy message!!) She Instagrammed a photo of the heart-shaped ring, captioning it: "He gave me his heart on Valentine's Day, and I said YES!" Love spares no one, huh? Oh, and afterwards the two celebrated at Gaga's family's restaurant, Joanne Trattoria, on New York's Upper West Side! We find normal to be super-adorbs, in this case! Image: Koffee With Karan Did you REALLY think SRK would be left out of anything that had the word romance in it? They met when they were teenagers and SRK was smitten from the word go by his future wife, Gauri! Not yet an established actor, they were facing opposition from her family on those grounds, plus the fact that they belonged to different religions. But just like in the movies, true love prevailed! Gauri had come to Mumbai with her friends and Shah Rukh followed her there. He had no clue where she was staying (we are talking pre-cell phones here) and was looking for her all over the city. They found each other at a beach in Mumbai, and that was the moment they decided they couldn’t live without each other. Apparently there were tears and everything! It may not be a conventional proposal (no ring! ), but it sure as hell can be counted. Bollywood’s most long-standing real love story, and it reinstates our faith in true love!